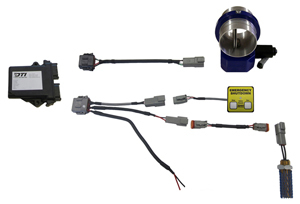 Air Intake Valve Shutdown, Stop/Run from inside cab, RPM Shutdown, RPM test, and Auto Cycling. The Guardian Basic Model is our entry level Guardian Safety System with Dash control and RPM Shutdown which offers superior protection in comparison with other air intake shut off valves in the market today. As of January 2018 transport Canada regulations B621-14 and B622-14 requires an automatic engine air intake shutdown systems on diesel engines while loading or off-loading class 2.1 or class 3 dangerous goods. As well, the national energy board regulation SA 2015-02 requires every diesel engine that operates in or near oil and gas site to be equipped with an adequate air intake shutdown vale, our guardian basic is our entry level system that we recommend installing on vehicles and equipment. To date the United States (OSHA) does not have any regulations in effect, however many oil and gas companies have as part of their safety programs a requirement or “best practice” for positive air shutdown systems on their sites. 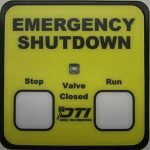 Many US companies that deliver class 2.1 and class 3 dangerous goods to Canadian plant sites are required to have positive air shutdown system as well. The dash control allows the user to shutdown and open the valve from inside the vehicles cab or on the equipment. The Valve Control Unit (VCU) allows for each engine to be programmed at a predefined RPM,once the engine reaches this set RPM (to within 1 RPM) it will activate the Valve to Shutdown. 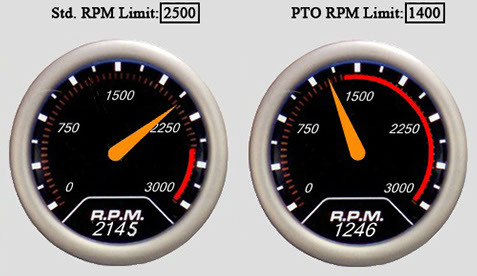 The standard RPM limit is set at 200 RPM above the Governed speed and this can be configured to set requirements with our more advanced models. The valve is a butterfly design with a newly designed metal flapper for our 3” and 4” valves which ensures you get a positive seal every time it is used. Our system uses a motor to control the valve and only closes if tested or by the operator, auto cycle, or by a high RPM event. 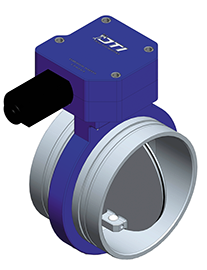 With our design there is no reduction in air flow through the valve because it flows in lines that do not waste airspace, unlike other systems on the market.